Frathen Drothan is a rogue Telvanni wizard. 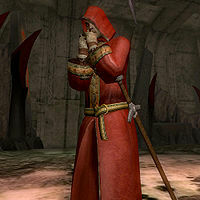 He leads the Drothmeri Army and searches Varsa Baalim for Mehrunes Razor, in hopes of using it to topple Imperial rule. He can be found studying Msirae Faythung in the Nefarivigum. He wears his unique leveled Spellturn Cloak and Bladeturn Hood, and will carry his key. In addition, he will wear leveled light gauntlets and boots, up to Glass quality and possibly enchanted (from level 3 onward). He will be equipped with a either a leveled longsword or claymore, up to Daedric quality, also possibly enchanted (from level 3 onward). Unearthing Mehrunes Razor: Conquer one of the deepest and most challenging dungeons in all of Cyrodiil to claim this fearsome weapon. He is the author of the Steward's Note, Drothan's Journal and Drothan's Field Journal. An unnamed cousin of his wrote a Small Diary. This page was last modified on 29 April 2016, at 20:13.